You are here: Home » Contributors » The Outrageous Muscle Car Years; Bellbottoms, Pistol-Grip Shifters, and Plum Crazy Colors! The Outrageous Muscle Car Years; Bellbottoms, Pistol-Grip Shifters, and Plum Crazy Colors! 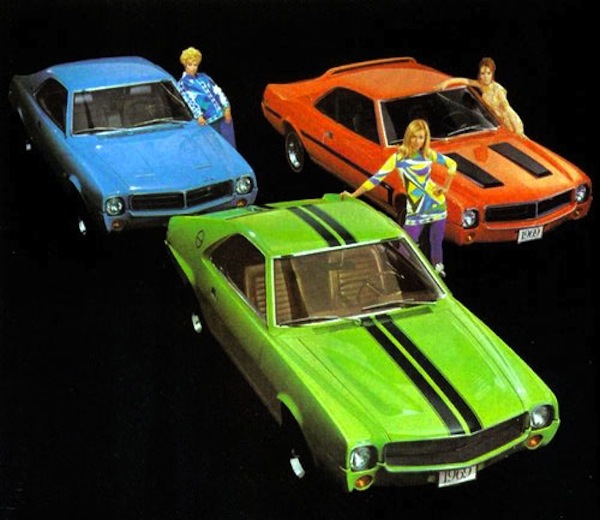 The AMC AMX in Big Bad Blue, Big Bad Green, and Big Bad Orange. A great example of the OUTRAGEOUS colors of the muscle cars years. This April is coming up soon and will mark my 40th wedding anniversary. My wife and I were recently going through a shoebox of old pictures and found some pictures of us, our friends, and a lot of relatives at the wedding reception. Some of the pictures are a little embarrassing. I got married in a rented baby blue leisure suit type outfit with a lace frilled shirt sticking out of the lapels, a white belt, and white rented shoes. I think the suit even had bell bottoms, and don’t laugh because it was cool in 1972! My old friends caught in some of the photographs had 70’s style sideburns and wore leisure suits and wide hip hugging belts. Looking back, those were the outrageous years. Everything about that time was “mod,” “psychedelic,” and “outrageous,” and that applied to clothes, haircuts, the lingo (“Groovy man”), and cars. In the early ’70’s the muscle car wars were in full battle. GM, Ford, Chrysler, and American Motors all had some form of outrageousness going on. 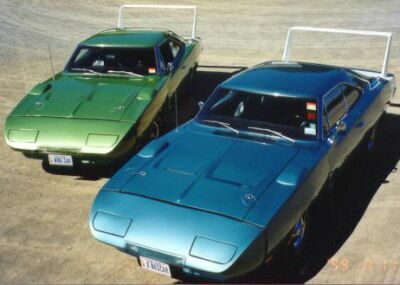 Plymouth SuperBirds and Dodge Daytonas had their outrageous high rear wings, sloped noses; and Hurst“Pistol Grip” shifters. Mustangs could be had with Boss 429 semi-hemi engines so big you had to shoehorn the engine out to change the spark plugs (which made mechanics outrageous). Hurst Oldsmobile 442s had huge wings, gold trim, gold wheels, and gold pin stripes. AMC had the outrageous Hurst SC/Rambler in red, white, and blue, with a big blue arrow on the hood that told the air which way to go into the engine (outrageous and more outrageous). Nothing about those cars was more outrageous than the colors, though. Chrysler, Dodge and Plymouth had an entire paint lineup called “High Impact,” and they came in colors like Plum Crazy, Sublime, Sassy Grass, Vitamin C Orange, Panther Pink, Hemi Orange, Curious Yellow and Top Banana. The names of the paint were as outrageous as the colors themselves (well, maybe not, but they were pretty groovy man) and it’s actually true that one of Chrysler’s High Impact Paint colors was named after a controversial 1967 Swedish film. Really! The film was called “I Am Curious (Yellow)” and was confiscated upon import to the United States. It was the subject of a 1969 U.S. Supreme Court case concerning freedom of speech in the 1st Amendment to the U.S. Constitution. AMC wasn’t to be left out of the fun. In 1969 they offered the “Big Bad” lineup of colors with Big Bad Blue, Big Bad Orange, and Big Bad Green. The “Big Bad” color option was a grand total of $34 and included color keyed front and rear bumpers, bright aluminum accent molding on the upper lip of the front bumper, and color keyed rear bumper guards. Just how outrageous were the “Big Bad” cars? Well, apparently pretty outrageous as they didn’t sell many of them. In ’69 only 195 buyers opted for the Big Bad Blue, 284 for the Big Bad Orange, and 283 for the Big Bad Green. (As a side note, the Big Bad cars bring 20-30% more in value today as a result than their non Big Bad counterparts.) 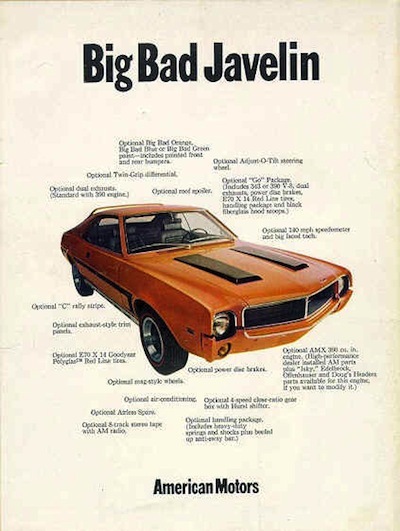 Can you imagine driving to church on Sunday morning in a brand new 1969 Big Bad Green Mod Javelin with a spoiler on the roof? Not only was the color outrageous, YOU were now outrageous as well. A 1969 sales brochure introducing the wild colors from AMC went like this (sounds very 70’s too)…. Who’s afraid of the Big Bad Colors? “Obviously American Motors isn’t. Because they’ve really gone way out with three color concoctions that will make your eyes do double takes. They’re called the Big Bad Colors: Big Bad Orange, Big Bad Green and Big Bad Blue. They happen on the new Javelins and AMXs, from bumper to bumper … including the bumpers. And they’re the boldest street machine skin covers since candy apple anythings and red lead primer. The Big Bad Orange means “Instant Parade” wherever you take your Javelin or AMX. And the shadows lurking in the background give you a pretty fair idea of what the other two Big Bads are all about too; the Big Bad Green and the Big Bad Blue. You have to realize there’s a lot more to the Big Bad Colors than just the colors. But then, if you like getting a lot of attention … being the center of attraction and drawing crowds … then you know what the Big Bad Colors are all about”. Groovy, eh? All of this brings me back to the fact that April will be my 40th wedding anniversary, and while I never want to wear bellbottoms again, taking my wife out in a Big Bad anything would still be right at the top of my list.